Take Route 22 East. Follow Route 22 East to the 4th Street Exit (last exit in PA). Veer left and exit onto Bushkill Street. Follow Bushkill Street for one block until you reach N. Third Street. Turn right onto N. Third Street. Go two blocks. You’ll see a tall soldiers & sailors monument ahead; that’s Centre Square, the location of the longest running open air market in the United States! Take I–78 West over the toll bridge into Pennsylvania. Take the first exit in PA exit 75 (it is marked “Easton”). Turn right at the stop sign at the end of the exit ramp onto Morgan Hill Road. Bear right at the next stop sign onto Philadelphia Road. Turn left at the next stop sign onto St. John Street. Continue on St.John Street down the hill and over the bridge at the bottom, get in the middle lane. Go straight through the traffic light onto Third Street. Proceed straight to Centre Square (approximately 2.5 blocks). 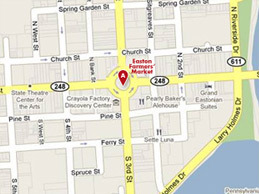 Or take Route 22 West East to the Easton Exit (NOT Rte. 611). Exit onto Snyder Street, make first left at traffic light onto N. Third Street. Follow Go two blocks. You’ll see a tall soldiers & sailors monument ahead; that’s Centre Square, the location of the longest running open air market in the United States! Take Route 611 North to Smith Street Bridge in Easton. Turn right at bridge Proceed straight to Centre Square (approximately 2.5 blocks). Take Route 33 South and exit to Route 22 East. Follow Route 22 East to the 4th Street Exit (last exit in PA). Veer left and exit onto Bushkill Street. Follow Bushkill Street for one block until you reach N. Third Street. Turn right onto N. Third Street. Go two blocks. You’ll see a tall soldiers & sailors monument ahead; that’s Centre Square, the location of the longest running open air market in the United States!